Gore and grotesque media is really having a moment right now, right? Not that humans haven’t always has some curious fascination with it. Historically there were traveling side shows featuring oddities and dedicated museums like The Mütter Museum where people could get up close and personal with the weird and gross. Now we have movies like Saw where a man with twisted morals stages elaborate tests for wayward individuals that are basically torture as an art form, and TV shows like The Walking Dead where zombies feast on the filthy survivors in a post apocalyptic United States. Heck, you can probably find a half-dozen local Zombie runs to sign up for right now (don’t forget to pick up some extra zombie blood)! Bloodbaths may have been normalized for some but there are some people out there that still need a trigger warning. So consider yourself warned! 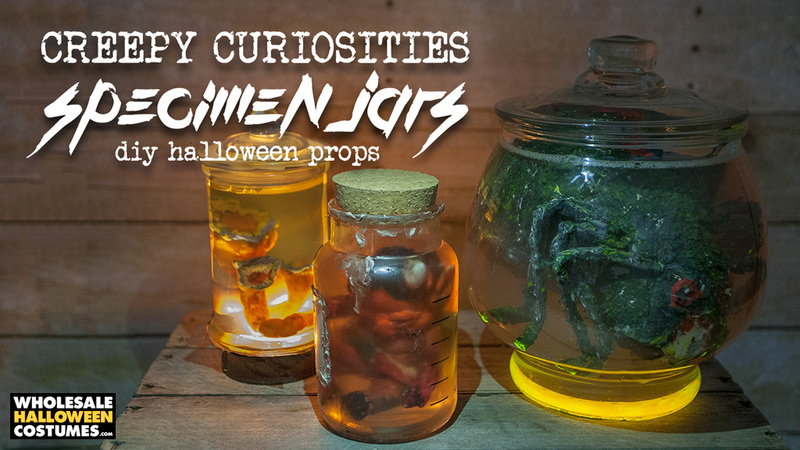 This tutorial will show you how to create some gross and insane props to showcase at your Halloween Creep Fest. Jump ahead to alien parasitic worms, mutated oversized spider, or evil rotten imp. This tutorial uses the Polly Plastics Moldable Thermo Plastic. There are many different brands, which would work very similar to this brand. If you don’t color the plastic when you melt it, you can skip straight to painting it all in one step. Step 1. Heat water in a kettle or microwave to at least 150 degrees F. Follow the directions enclosed with the thermoplastic. Add 1 Tbs of the plastic pellets to the hot water. Step 2. The plastic pellets will start to turn clear and clump together. Let the plastic sit in the hot water for approximately 2 min. Use a metal spoon to clump the metal-plastic pellets together and remove them carefully from the water. It’s important to use the metal spoon since the plastic will bond to a plastic spoon. Step 3. Knead the plastic together between your fingers. If the plastic starts to get too stiff, just put it back in the hot water and let it soften up again. You might need to periodically reheat the water. Step 4. 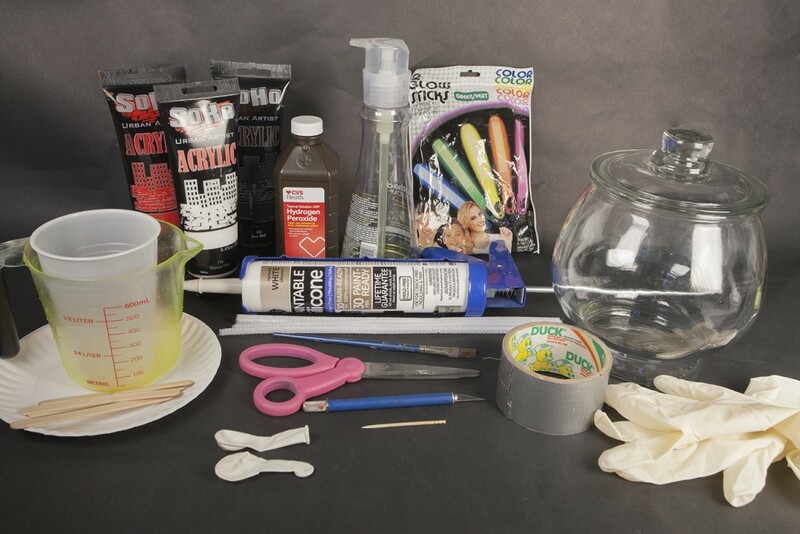 Shape the plastic like a worm, flattening one end, to create a large open mouth. Step 5. As the plastic starts to harden, use the small metal tool or knife to press lines around the body of the worm, this will create a textured effect on the worm. Let the plastic cool. As it cools, it will change from clear to opaque white. Step 6. Drop some sunset orange alcohol ink on the worm. The ink will spread and fill in all of the crevices and imperfections in the plastic. Step 7. You can use and old brush to spread the ink around the plastic. The ink dries very quickly, so it might not spread too far. Step 8. Add more ink to the worm, switching colors between ginger, latte and caramel. Step 9. Color the inside of the mouth with purple twilight ink. Step 10. Line the outside of the mouth with silicone. Step 11. Using the toothpick, gently pull the silicone toward the mouth to create teeth. Let the silicone dry for at least 30 min, depending on the instructions provided by the manufacturer. Once dry, the silicone is 100% waterproof. Step 12. 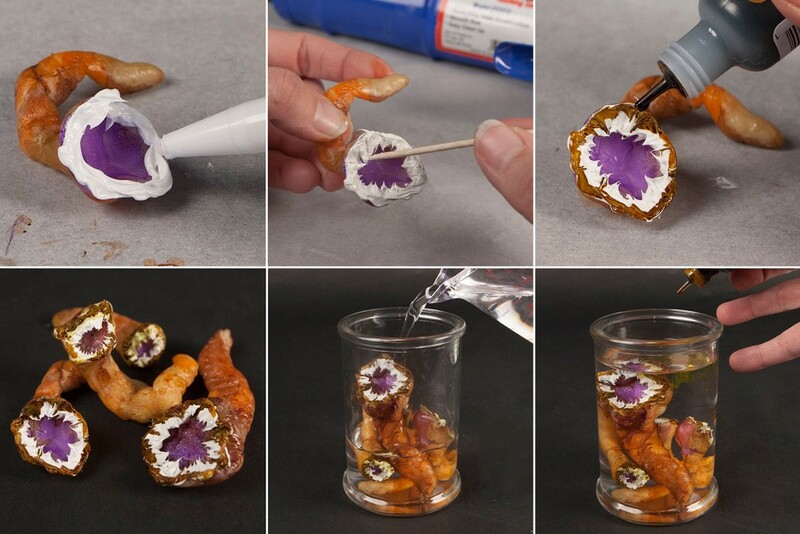 Use ginger ink to blend the edges of the silicone with the plastic body of the worm. Step 13. Repeat the steps above to create more worms of different shapes and sizes that will fill your jar. Step 14. Place the worms in your jar and fill with water. Step 15. Add a few drops of yellow ink to the water. 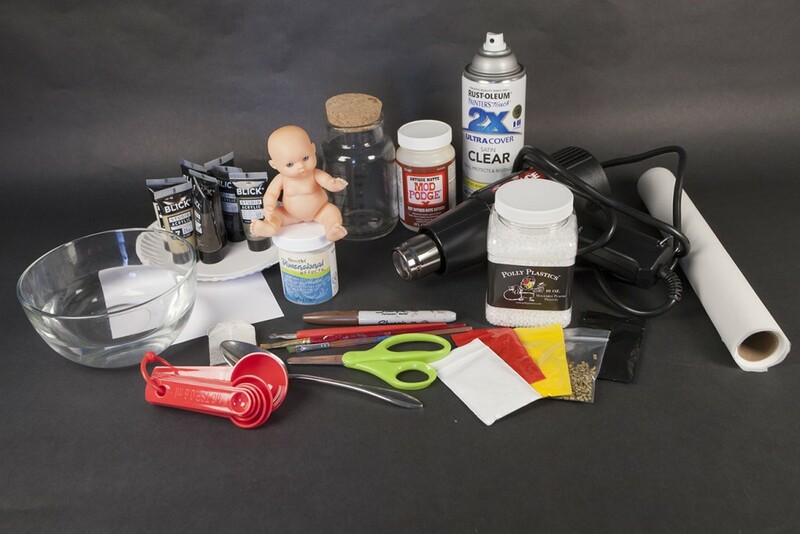 This will help make the specimens look like they are floating in formaldehyde. Step 16. 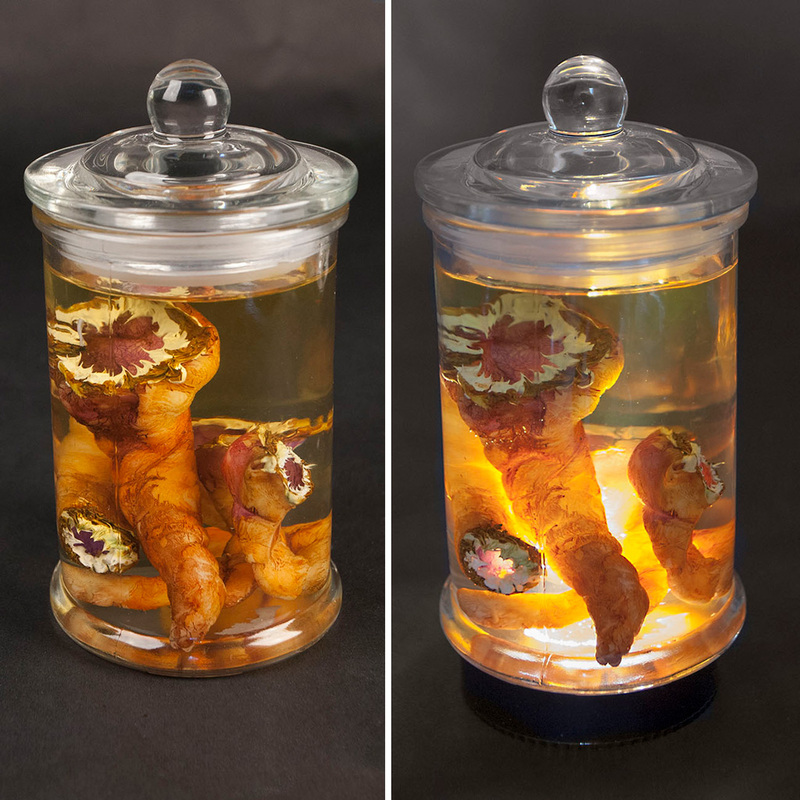 The worms look pretty gross on their own, however, you can place the jar on an LED bottom light to illuminate them. Note 1: The glowing effect is temporary like a glowstick. 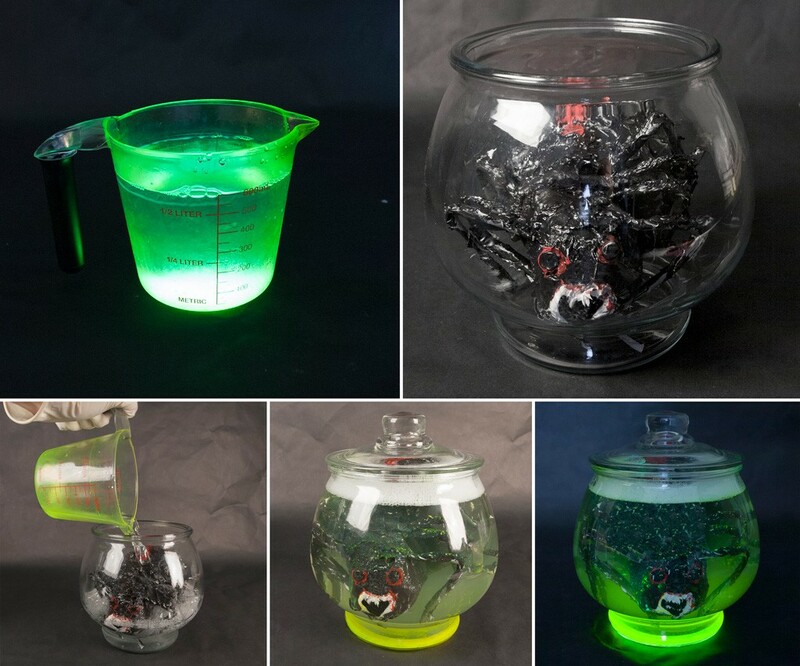 You can make the spider ahead of time, and then mix the glowing liquid right before you are ready to display it. Opening the glow stick, and should be done by an adult. Use gloves and newspaper to keep your workspace clean. Step 1. Blow up the balloons to create the body and head of the spider. Make sure that the balloons are inflated small enough to fit in the jar. Step 2. 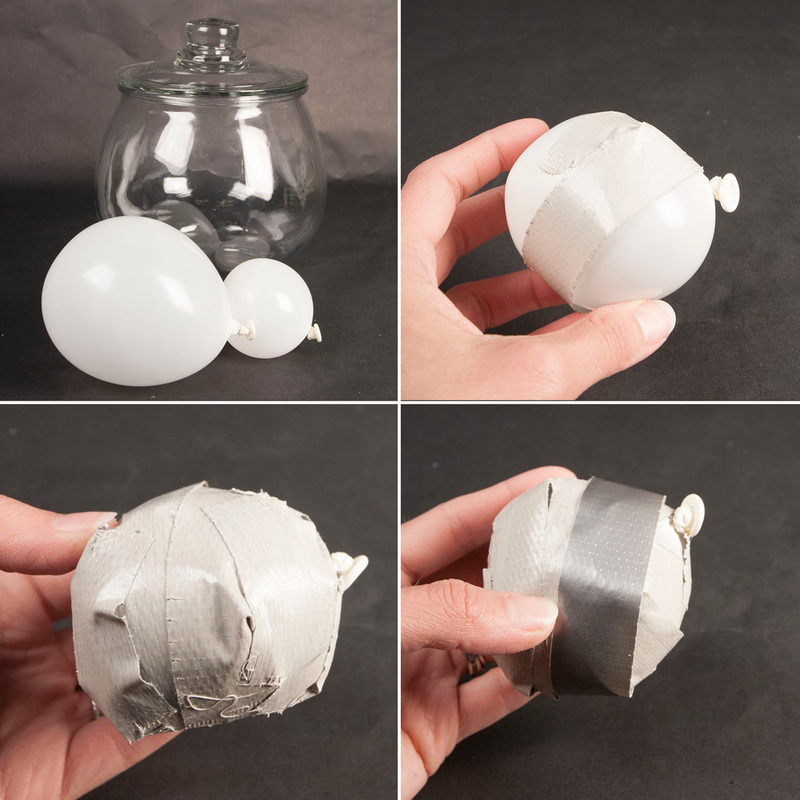 Wrap a strip of duct tape around the smaller balloon, with the STICKY SIDE FACING OUT. Step 3. Continue wrapping the balloon until it’s completely covered. The sticky side should be face out. Step. 4. Wrap the balloon in another layer of duct tape, this time with the STICKY SIDE FACING IN. Step 5. 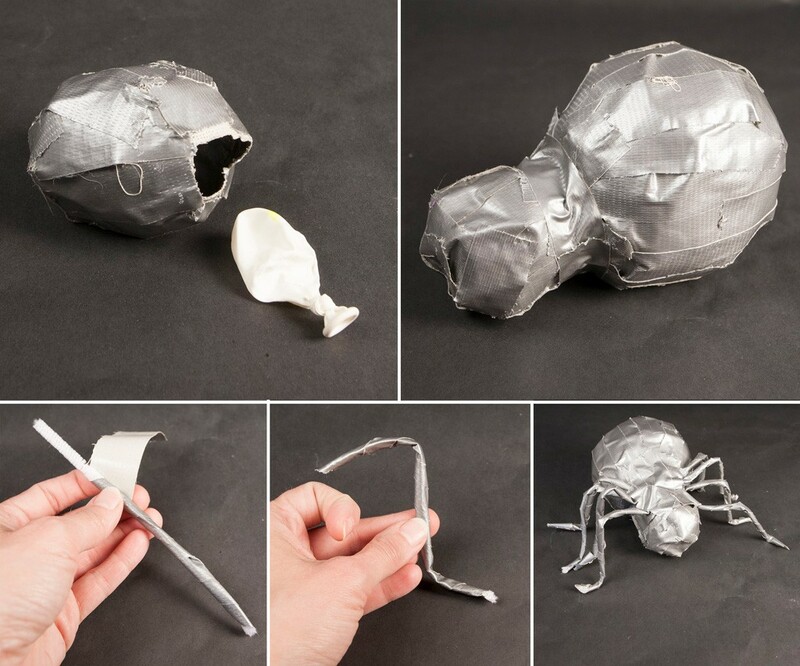 Pop the balloon and remove it from the duct tape spider head. Step 6. Repeat steps 2-5 with the larger balloon. When done, tape the pieces together to create the spider’s body. Step 7. Cut the pipe cleaners in half, so you end up with 8 smaller pieces. Wrap each piece in duct tape. Step 8. When the pieces have been wrapped, shape them to create the legs of the spider. Step 9. Tape the legs to the head of the spider, as shown. Step 10. Lastly, make small fangs out of the duct tape. Step 11. Since the spider will be submerged, all of the parts should be waterproof. Use the Paintable Silicone to add texture to the spider’s body. Step 12. Add the silicone along the legs, back, fangs and mouth of the spider. Once done, use the toothpick to create a furry texture in the silicone. 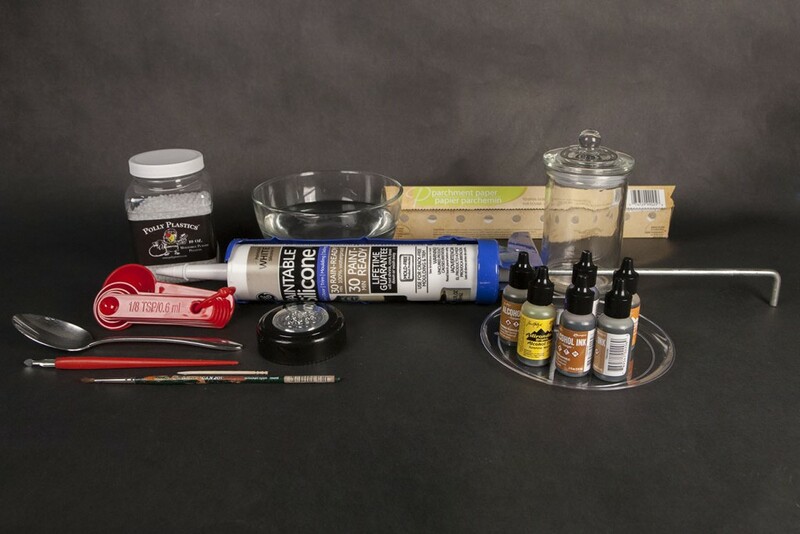 The silicone that I used dries in approximately 30 min and can be painted. Follow the instructions provided by the manufacturer. Step 13. Paint the body of the spider black, leaving the fangs white. Step 14. Finish up the body by adding red along it’s back, around the mouth and eyes. Let it dry. OPTIONAL- you can give the final spider a coat of a clear spray sealer. This will ensure the paint will last longer once it’s submerged. Step 15. MAKING THE GLOWING LIQUID- Prepare your supplies, have 2 cups of water in an old plastic measuring cup (not to be used for food prep). While wearing gloves, break one of the glowsticks to activate it. Shake it very well. Step 16. Use the craft knife to carefully slice open the glowstick, about 1/8 to a 1/4 inch from the bottom. Step 17. The glowstick contains a small glass vial that is broken open when it’s cracked to activate. 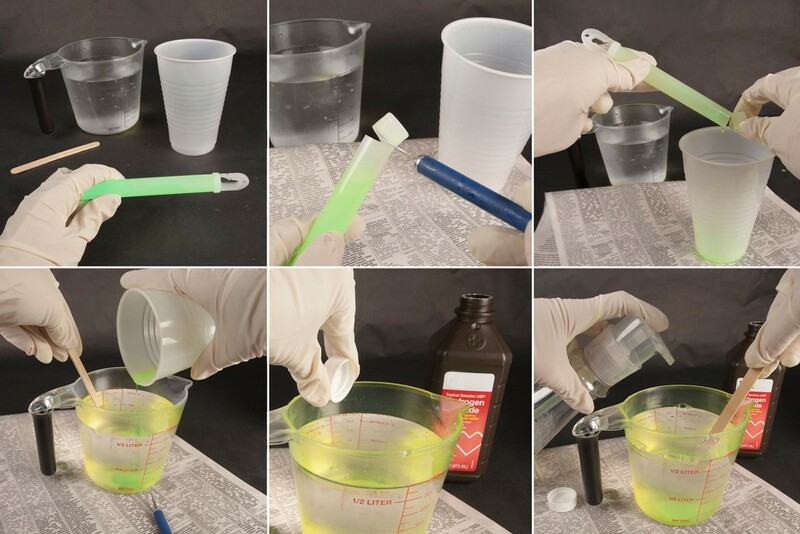 Gently pour the contents of the glowstick into a plastic cup, the majority of the glass pieces will stay in the glowstick vial. Some pieces may pour into the cup. Step 18. Pour the liquid from the cup into the water, making sure any glass pieces remain in the cup. Dispose of the glowstick and the plastic cup when finished. Step 19. Add about a capful of hydrogen peroxide to the water. Step 20. Add a squirt of dish soap to the water. These 2 ingredients will help enhance the glow of the water. Step 21. Gently stir the water to mix all of the ingredients. It will now glow, just like the glow stick. Step 22. Fit the spider inside the jar. Step 23. Pour the mixture over the spider. You might need to repeat the above steps with 1-2 more glowsticks to fill up your jar. Step 24. If the spider is floating too much, use the craft knife to poke a hole in the spider’s belly to let the water fill the body and help it sink. The dish soap might cause the mixture to bubble up, but this will add to the creepy effect. Step 25. You now have a glowing mutant spider specimen. The glow effect will last about as long as a glowstick, but it still looks cool after the effect wears off. Step 2. The plastic pellets will start to turn clear and clump together. If using the color kit, add 2 yellow, 1 red and 1 white color pellets to the water. Let the plastic sit in the hot water for approximately 2 min. Step 3. Use a metal spoon to clump the metal-plastic pellets together and remove them carefully from the water. It’s important to use the metal spoon since the plastic will bond to a plastic spoon. Step 4. Knead the plastic together until it starts to turn a pinkish, fleshy color. If the plastic starts to get stiff, just put it back in the hot water and let it soften up again. As you are working, leave any extra plastic in the bowl of hot water. You might need to periodically reheat the water. Step 5. Pull off a small piece of plastic, and form it into a pointed ear, covering the ear on the doll. The warm plastic should adhere somewhat to the plastic doll. Step 6. 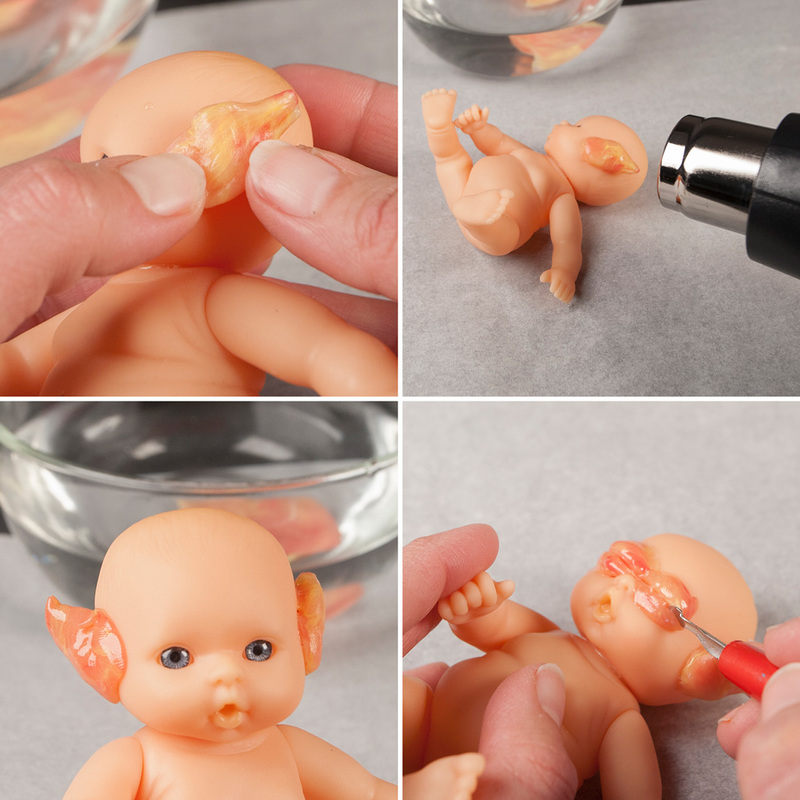 Use the heat gun to soften the plastic a little more, so that it sticks throughly to the baby doll. The heat gun will also smooth out the plastic and make it a little more pliable for small details. Step 7. Using the same technique, make the 2nd ear. Step 8. 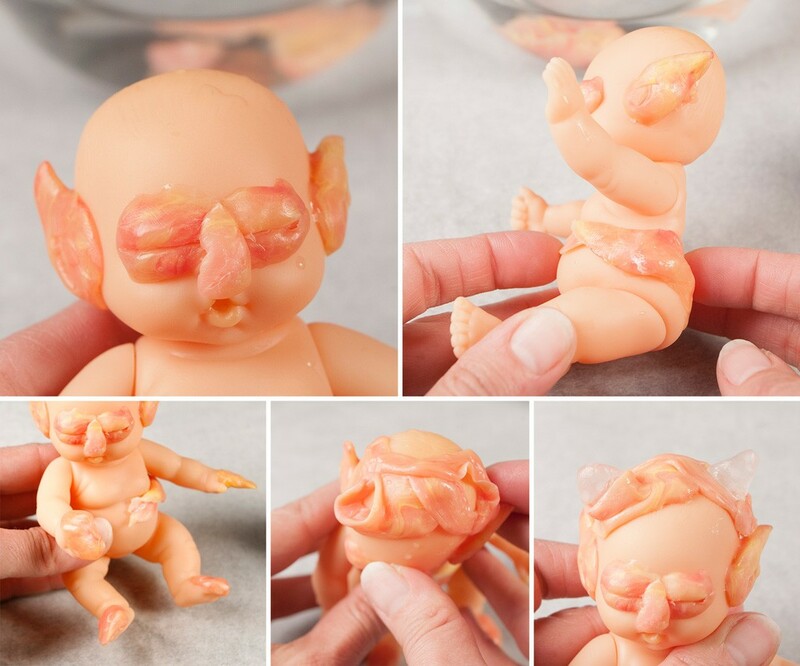 Make 2 small little balls of plastic and cover the doll’s eyes. Use the small knife or metal tool to draw lines in the eyes. This will give the impression the imp’s eyes are closed. Step 9. Make a nose. Step 10. Make a long, skinny tail that attaches from the doll’s backside and wraps around the front. Step 11. Add small pieces of plastic to the hands and feet to make them look less human and more claw-like. Step 13. Melt about ¼ teaspoon of plastic pellets in the hot water. Shape them into little horns and fit them into the openings from step 12. The plastic will be clear but dries white. Step 14. To create the plastic for the wings, melt ½ Tbs of plastic pellets in the hot water. Add 2 gold and 1 black pellet. Step 15. Mold little wings for the imp. Make sure that wings are tucked in tightly so that the imp still fits inside the opening of the jar. Step 16. Use a small piece of the gold plastic to make the tip of the tail. The imp is ready to paint. Step 17. Mix together red, brown and a little bit of black paint to create a deep, rusty red color and start painting the imp’s face. Step 18. Paint the hair black. You can add a little watered down black or grey around the base of the horns for a shadow effect. Step 19. Finish painting all sides of the imp. I painted the tip of the tail, and the bottom of the feet black. I added a little bit of black on the wings for detail. Let dry. Step 20. Since the imp will be submerged in liquid, I used a spray paint sealer to protect the paint and keep it from peeling off. Spray the whole imp and let dry. While the imp is drying, you can start aging the bottle. Step 21. Cut a small label from the paper and adhere it to the bottle with the Antique Matte Modge Podge. Cover the top of the paper with the modge podge. It will get darker with each coat. Step 22. 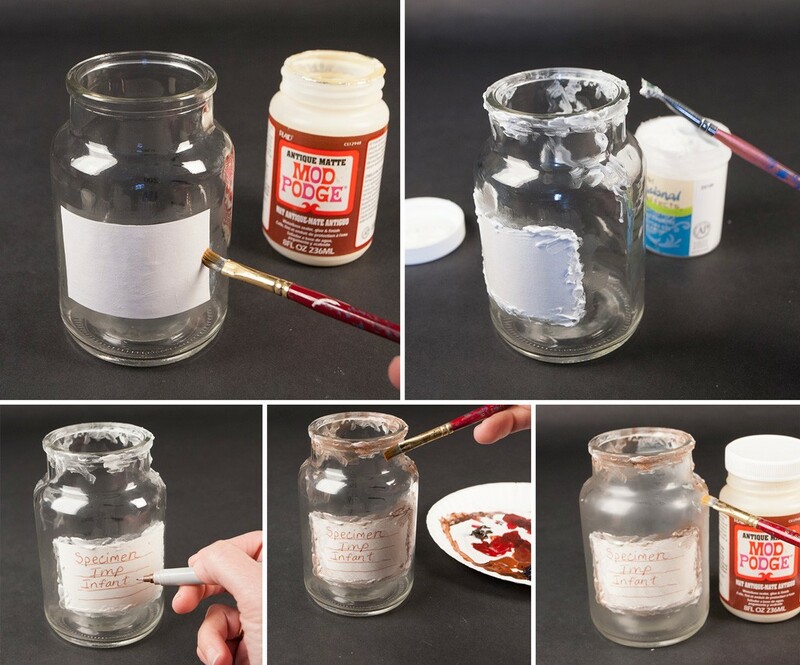 Add dimensional gel around the edges of the label and jar rim to create the illusion of dirt or caustic material. Let the modge podge and dimensional gel dry according to the package. Step 23. Use a thin brown marker to label your specimen. I kept mine simple, but you can add all sorts of information. Step 24. Mix together brown and black paint. Thin it out and paint the dimensional gel to make it look dirty. Step 25. To finish the aging effect, apply a thin coat of the modge podge over the entire jar. This will create a grimy look. Step 26. Brew some tea to use as the liquid in the jar. Once the tea is ready, dilute it with water until you reach the desired color. Start with a mixture of ½ tea and ½ water is good. If it’s too dark, you can dilute it more. Step 27. Stuff the imp in the jar, and make sure the face isn’t covered by the label. Step 28. Add the tea and cork the jar. Have something you think will creep us out? We dare you to share it with us on Facebook, Twitter and Instagram! Save these specimens to your Halloween DIY boards.